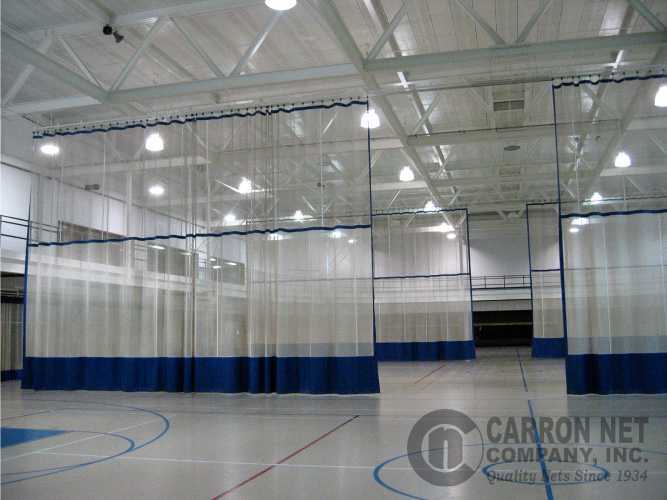 Carron gym divider curtains are built for durability and value. With a variety of constructions, our popular gym divider curtains create opportunities for several sports in the same gym at the same time. The name "Gym Divider Curtain" usually means two materials are used. The upper part is generally made of smooth hanging scrim mesh to allow light to pass through and air to circulate. The lower portion, typically 8', is constructed of opaque heavy-duty vinyl to give you effective visual and sound separation between multiple activities. Solid vinyl curtains and those incorporating nylon netting in the upper portion are also available. The weight of these curtains means they are most often installed as walk-draw curtain on an aluminum track. Installation via cable mounting or integration into motorized lift systems may also be options. ALL CARRON GYM DIVIDER CURTAINS ARE MADE TO ORDER. Request a quote or call for more information.